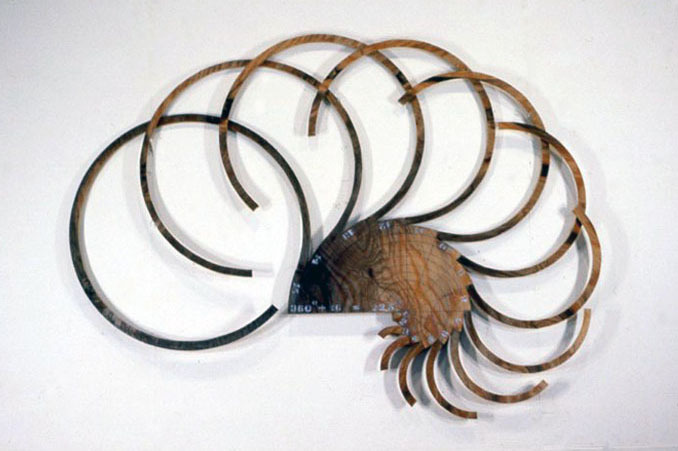 Nickel used a logarithmic spiral divided into 13 parts to create this Circle Piece. He stenciled the formula “60° divided by 13” onto the wood, then made his cuts and reorganized the parts into a suggestive vortex. As with all Circle Pieces, the process preempts the final results; the formula was merely a control to cut the wood. H: 42 in. x W: 5 ft. 6 in. x D: 1 in.